I promise I wouldn’t make a claim like that unless I really meant it, but I really mean it. 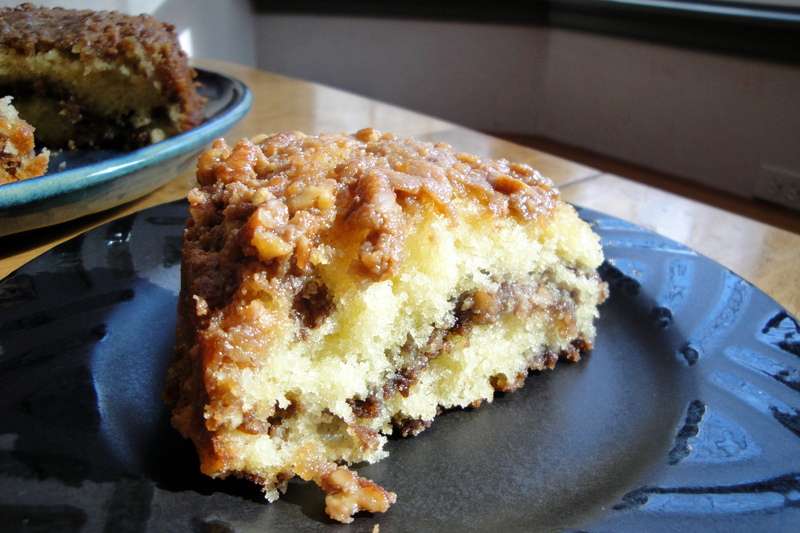 I’ve been making this coffee cake for a few years now, and the fact that I keep making it, time after time, is a testament to how truly wonderful it is. Until I brought myself to buy a 9″ cake pan, I used to make it in an 8″ and then make a mini one with the extra batter, and I’d give it to my uncle who would polish it off in one sitting. 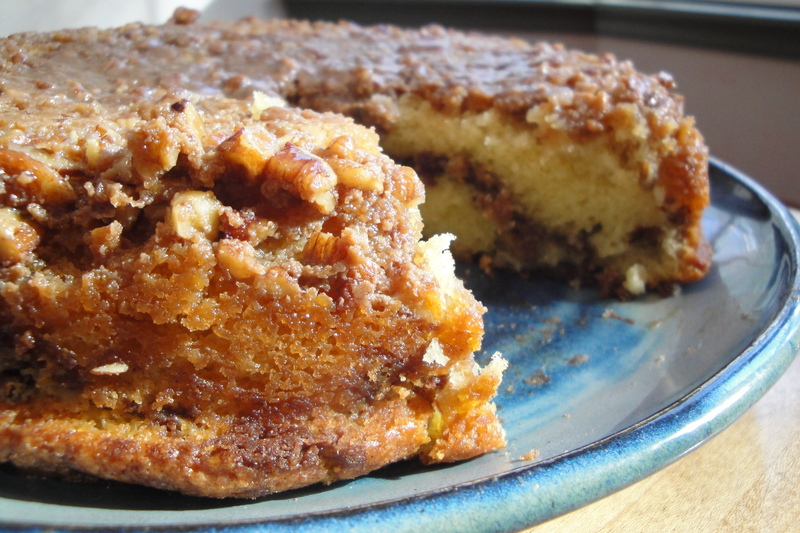 I’m not kidding here when I tell you that you could break hearts, win hearts, and get everything you’ve ever wanted just be serving this coffee cake to somebody. Usually I try not to repeat recipes, because it’s so much fun to try new things and make new discoveries. But sometimes there are recipes that you stumble upon, and for one reason or another they just stick with you forever. This is one of the select few, and I doubt I’ll ever stop pumping them out of my kitchen. Another great feature of this cake is that it comes out perfectly every time. This past weekend, I didn’t have buttermilk so I made my own substitute (skim milk and lemon), and used sour cream in place of yogurt, and it was still perfect — maybe even more than perfect. The point is, you can make a good number of (thoughtful) alterations, and the cake still has this magical way of ending up creamy and caramel-y and moist and incredible. I usually only make the cake for special occasions — it’s not particularly difficult, but the end results seems too good to make on a regular basis. 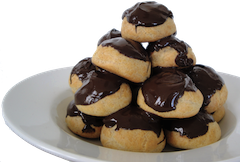 It is the most moist, complex and utterly delicious breakfast treat that I have ever come across, even when compared to some of the professionally made baked goods I’ve tried at my favorite bakeries. This time I made it for my mom’s big birthday weekend, and it was enjoyed by all. It’s one of her all-time favorites, and fortunately for the rest of my family, we feel the same way too. I wish I had the recipe with me so that I could share the wealth, but this particular recipe comes from a back-issue of Cuisine that lives in my parent’s kitchen. The pages of that particular issue are covered with buttery fingerprints and crumbs of brown sugar streusel — the magazine will never be the same, but I think it holds within it the love and happiness that comes with repeating the recipe time and time again. Unfortunately now I’m back to being stuck in the confines of dormitory life, and this time little room barely offers me space to sleep, let alone keep stacks of old magazines piled up for safe keeping. But I’ll be sure to post it if I remember the next time I get my hands on it — I’m sure I’ll be making it again soon before too long. Preheat oven to 350 degrees F, and coat a 9" cake pan with nonstick cooking spray. Whisk together brown sugar, cream and salt for the caramel until incorporated. Pour caramel into prepared pan and swirl to coat the bottom. Sprinkle pecans evenly over the caramel. Process brown sugar, flour, butter, cinnamon and salt for the streusel in a food processor. Pulse until small clumps form, set aside. Whisk buttermilk, yogurt and eggs together for the cake in a measuring cup with a pour spout. Sift flour, baking powder, baking soda and salt into a medium bowl. In a separate bowl, cream butter and sugar until combined. Alternately add dry and wet ingredients, starting and ending with the dry. Blend each addition just until incorporated - don't over-mix! Spread half the batter over the caramel, then sprinkle with half the streusel. Carefully spread remaining batter over that and top with remaining streusel. Bake 50-60 minutes, or until a toothpick comes out clean. Cool cake for 5 minutes on a rack, then run a paring knife around the sides to loosen. Invert onto a serving platter while hot, then let cool slightly before slicing.